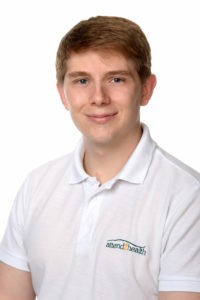 Alex qualified from the British School of Osteopathy with Distinction. His interest in osteopathy grew from a keen sporting background having been on the receiving end of injuries and finding osteopathic treatment beneficial in both recovery as well as enhancing general well-being. A keen sportsman, he has participated in a wide variety of sports but especially Karate currently holding the rank of 3rd dan blackbelt and over 20 years’ experience. He is also an English Karate Federation level 4 head coach. Alex has a strong interest in anatomy and physiology and how this relates to human function, providing treatments specifically tailored to the individual. He uses structural techniques as well as exercise and therapeutic advice to manage pain, facilitate healing and improve overall well-being. He is also qualified in sports massage and certified in Kinesio taping techniques. Alex enjoys treating patients of all ages and walks of life, but has a special interest in sports injuries and performance.